A10 Talk’s weekly power rankings is a subjective list that ranks every Atlantic 10 team based on how good they are overall. This is not a direct reflection of conference standings or NCAA Tournament potential. Be sure to check out last week’s power rankings post. Here are this week’s power rankings. I’ve still got Dayton as the top team in the league, despite the success that VCU has had lately. The Flyers already have 21 wins, and after a gritty win over St. Bonaventure on Saturday, they’ve now won 6 in a row. Dayton has to play George Mason, Davidson, VCU, and George Washington to finish the regular season, but most of these games are looking very winnable. VCU is not very far behind Dayton at all right now. VCU is inching closer and closer to Dayton at the top, especially after an impressive road win over Richmond. Having won 8 in a row, the Rams look like a virtual lock for the NCAA Tournament. Though this team is tied on top of the A-10 standings and currently owns the head-to-head over Dayton, things could change between now and the end of the season. The Rams have yet to face Rhode Island and Dayton on the road. If the Rams want to win the Atlantic 10 this season, it’s going to have to pull out some tough ones down the stretch. Richmond surpasses Rhode Island and takes the 3 spot, though both teams had somewhat of a rough week. The Spiders went 0-2 on the road against George Mason and at home against VCU. Rhode Island dropped a questionable home game to Fordham but beat George Mason in Fairfax. These teams are basically equal power rankings wise at this point. Rhode Island may be a little stronger, but the Spiders have nonetheless looked solid as of late. The Rams played their worst game of the season last week against Fordham. As noted, Rhode Island’s home loss to Fordham drops the Rams a spot to #4. Sure, the bounce-back win over Mason helps a little bit, but at the end of the day, this could be the loss that keeps Rhode Island out of the NCAA Tournament. The Rams still get to host VCU, but it seems like they’re running out of opportunities to build a solid NCAA Tournament resume. They better hope they show up to play in Pittsburgh in a few weeks. Had the Patriots taken down Rhode Island at home, they’d be in third place in the Atlantic 10 and on a 5 game winning streak. Unfortunately, that close loss really stings because Rhode Island, Richmond, and St. Bonaventure stay ahead of the Patriots in the league standings, and this team still has to play Dayton and VCU on the road. They probably won’t get a double-bye in Pittsburgh, but the Patriots are exceeding expectations. Jaylen Adams showed up in a big time way against Dayton on Saturday, and despite the Bonnies falling just short on the road, this team is clearly talented and capable. I think there’s definitely an argument to be made for the Bonnies in the 5 spot this week. George Mason’s home win over Richmond gave the Patriots a nice boost, but I’m pretty confident that St. Bonaventure and George Mason are almost exchangeable at the 5 and 6 spots. La Salle has been really hit or miss this season, and I think this team fits perfectly in the 7 spot. Things haven’t exactly been going great for the Explorers recently, but a relatively easy finishing schedule could help La Salle a lot. La Salle has a great chance of ending up as a 5 or 6 seed by the end of the season, believe it or not. This really feels like the right spot for Davidson here on out. The Wildcats won their last 2 and have been somewhat on the rise. The Wildcats have kind of a brutal end to the season with home games against Dayton and St. Bonaventure and road games against Rhode Island and Richmond. That will not be easy. Let’s get a little bold. Why not? 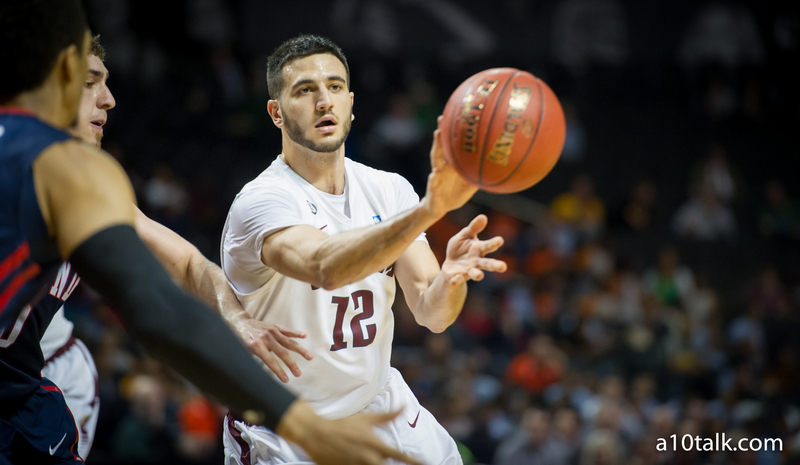 Fordham has been playing like it belongs in the middle half of the conference lately. The Rams have allowed just 83 points in their last two games combined, which has been pretty darn awesome to say the least. While this team continues to play stellar defense and pull some shocking upsets around the league, it also finds itself with 6 conference wins. I would not want to face Fordham right now. George Washington is trying to finish better than .500 this season, and I’m not sure it’s going to happen. This is certainly an off-year for this team, which is unfortunate for Tyler Cavanaugh and the returning members from last year’s NIT Championship team. The Colonials will be back, but it’s not going to be at the end of this season. Massachusetts has had quite a disappointing conference season, and it has to be frustrating for this program and its fanbase. This team has a lot of young talent, so I wouldn’t count out the next couple of seasons, but the Minutemen have now lost 7 of their last 8 and stand at just 3-11 in conference play. A 30 point spanking from Duquesne is embarrassing to say the least. I can’t say this is anything of what Massachusetts expected. With all of the injuries this team has had to deal with, coming in at 12th overall is excusable. I really do feel for Phil Martelli and all that his team has been burdened by. There’s a decent chance the Hawks come in 14th in the Atlantic 10 when the standings are finalized in the next couple weeks. I didn’t see that coming. Saint Louis isn’t good by any means, but it’s got to be decently happy with 4 conference wins at this point. Any win right now is an appetizer for what this team is going to possess in the coming seasons. Be patient. Duquesne beat Massachusetts by 30 points which had to be a pretty fun performance for this team. Don’t expect trends like those to continue. Duquesne is still pretty bad, and Massachusetts is as well. VCU has a longer winning streak and the H2H with Dayton right now. As of today, how does that not warrant VCU being number 1? Sure, if Dayton wins on their home court, we can discuss Dayton being #1 then. But as of now, I would think VCU takes the top spot. This site is so obviously Dayton biased it is unreal. Longer win streak means nothing not to mention beat Dayton. Could you make your preference a little less obvious? Matt and Puppumae are correct, fyi.